You rarely get to see more than one Ruth Asawa wire lobe sculpture, and you almost never get to see works on paper. So get to David Zwirner’s place, because they have it all right now. It is probably the biggest assemblage of Asawa’s work since the 2006 show at the de Young Museum in San Francisco. 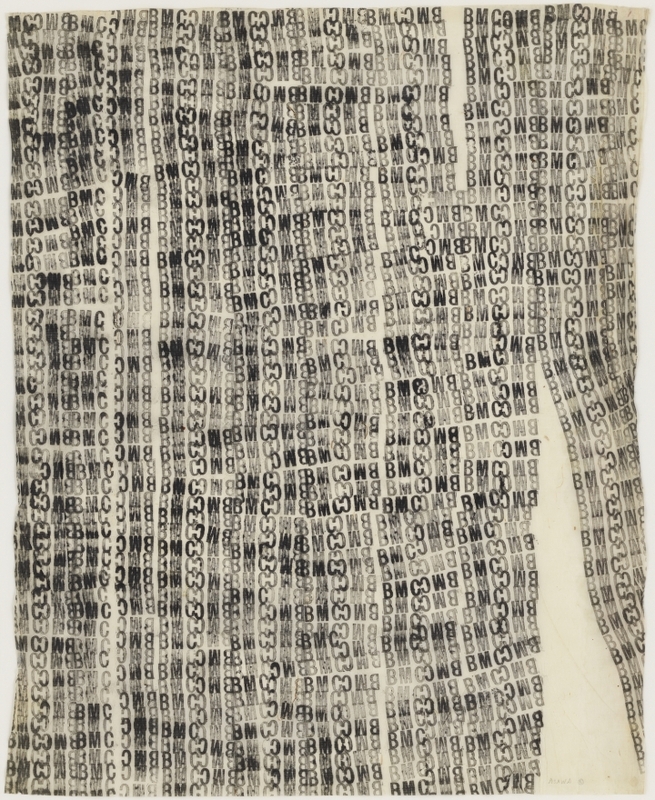 And I guess I wasn’t attuned to it at the time, but Asawa’s rubber stamp drawings from Black Mountain College are extraordinary. Here’s one made with the BMC laundry stamp. Her sculptures have always felt like line drawings in space, and these feel like word sculptures on paper. Another thing I was not paying enough attention to in 2007: one of Asawa’s BMC laundry stamp drawings was used as the basis for a mattress ticking? How did that happen?